As we get older, some of us may end up developing brain diseases. As a result, we can take action to manage brain diseases. Most of all, some of the best free ways to fight brain diseases include physical exercise. Furthermore, studies show they have positive effects on brain diseases. Therefore, physical exercises and their effects on various brain diseases are described. Reducing the risk of brain diseases such as dementia. Noteworthy that dementia risks grow with age. However, aerobic exercises such as running and cycling may help stave off brain diseases such as Alzheimer’s disease and other forms of dementia. Resistance exercise, has the following benefits: 1) Improved executive functions, such as focusing on complex tasks, organizing, thinking abstractly, and planning for future events; 2) Studies show resistance training programs can improve the executive function of senior women; 3) Improved memory and working memory. Flexibility exercises, have been shown to have the following benefits: improved memory, improved thinking and, reducing stress. Balances exercises, have been shown to improve motor skills, memory and, spatial cognition. Aerobic exercises can cause physiological changes to occur in the brain. Surges in growth hormones. Furthermore, growth hormones provide a nourishing environment for the growth of brain cells. Studies have shown that physical activity generally increases brain volume and can reduce the number and size of age-related holes in the brain’s white and gray matter. Most noteworthy, one brain scanning study showed those between 60 to 70 years old had, after six months of aerobic exercise, a significant increase in their brain volume. Aerobic exercise increases the gray matter in the frontal lobes. 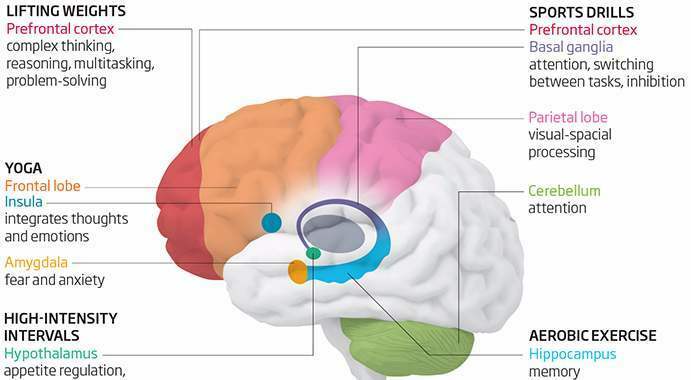 Furthermore, the frontal lobes are responsible for cognitive functions. Especially relevant is that the frontal lobes consists of the dorsal anterior cingulate cortex, supplementary motor area, middle frontal gyrus, dorsolateral region of the right inferior frontal gyrus, and the left superior temporal lobe. Hippocampal neurons pumping out a protein called Brain-Derived Neurotrophic Factor (BDNF). In addition, BDNF: 1) Promotes growth of neurons and other brain cells; 2) Helps repair and protect brain cells from degeneration; 3) Increases the ability to transmit signals from neuron to neuron. Consequently, learning and memory improves. ; 4) Production is increased with amount of aerobic exercise; 5) Has been been associated with depression, bipolar disorders, and schizophrenia, when its level gets too low. Growth of neurons and other brain cells increases the size of the hippocampus. Most noteworthy is that adults with highest level of BDNF in their blood had the biggest increase. Especially relevant is that the hippocampus is responsible for memory and learning. Helps generate new non-neuronal brain cells in the area of the brain called dentate gyrus, an area of the hippocampus linked to creation of new memories. In addition, brain cells, depleted during times of stress, are replenished. Regular resistance exercise changes the following areas of the brain: Prefrontal regions of the frontal lobe, that are responsible for executive functions and, Medial temporal lobe, which help memory and working memory. Flexibility exercises (such as yoga) have been shown to have the following physiological changes to the brain: Brain scans using Magnetic Resonance Imaging (MRI) showed shrinkage in right basolateral amygdala gray matter density (a deep-brain structure strongly implicated in processing stress, fear and anxiety). Balances exercises, have been shown to have the following changes in the brain: Increased the size of the basal ganglia: a group of brain nuclei responsible for motor skills. It was recently discovered that physical activity improved the brain’s white matter integrity of study participants aged 60 to 78. Most of all, physical activity improved the microstructures of white matter. Most noteworthy is that white matter integrity results in faster neural conduction between brain regions. Consequently this leads to superior cognitive performance. First of all, white matter consists of glial cells and neurons (the nerve cells). Also, glial cells are non-neuronal cells that provide support and protection for the neurons. Most noteworthy is that the glial cells also form myelin. Especially relevant is that myelin is composed of lipid tissue that is surrounded by capillaries. Furthermore, these capillaries bring oxygen. Most noteworthy is that aerobic exercise increases the flow of blood through these capillaries. Therefore, more oxygen and other nutrients are delivered to the myelin. Also, neurons communicate with each other using axons (also known as nerve fibers). Most noteworthy, the axons are encapsulated in myelin sheath formed by glial cells. Furthermore, the myelin sheath insulates axons and helps them send electrical signals controlling movement, speech, and other functions. In addition, axons help form communication links between different regions of gray matter in the cerebrum, as well as links between the cerebrum and lower brain centers including the cerebellum. In addition, aerobic activities bring extra oxygen and nutrients to the brain. As a result, the axons, in the white matter, bundle more tightly and become more compact.. Consequently white matter integrity is improved. In conclusion, the more streamlined and compact the white matter, the faster and more efficiently the brain functions. A small 2016 study showed that both stretching and aerobic exercises, preserve and potentially improve brain volume. Because of the increase in the amount of gray matter in most areas of the brain, including the area sustaining short-term memory, brain volume is increased. Of the two, aerobic exercise is best for preserving and improving brain volume. Most noteworthy, aerobic exercise produced the more extensive brain changes than stretching. Most noteworthy is that the study’s aerobic participants displayed improved executive functioning, while the stretching group showed no improvement in executive functioning. Especially relevant is that the MRI scan results for the stretching group indicated some atrophy within the brain’s white matter. Incidentally, white matter consist of nerve cell bundles that connect gray areas of the brain. Scientists in Finland compared head-to-head the neurological impacts of different types of exercise: running, weight training and HIIT. Paradoxically, the results suggest that HIIT may not be the best option for long-term brain health. Sustained moderate aerobic exercise might be most beneficial for brain health. Especially relevant is that long distance running stimulates release of a particular substance in the brain known as BDNF which is known to help brain cells. And the more miles you run the more BDNF is produced. Most noteworthy is that weight training, while extremely beneficial for muscular health, has previously been shown to have little effect on the body’s level of BDNF. Especially relevant is that HIIT's potential brain benefits may be undercut by its very intensity. Furthermore, it is much more physiologically draining and stressful than moderate running and stress tends to decrease hippocampal volume in adults. Seems like weight training and HIIT might encourage creation of additional blood vessels or new connections between brain cells or between different parts of the brain. Studies showed a group that lifted weights saw significant improvements in executive function, performed better in tests of associative memory (which is used for things like linking someone’s name to their face). Furthermore, the aerobic exercise group saw improvements to verbal memory (the ability to remember that word you had on the tip of your tongue). Most noteworthy, simply stretching had no effect on either memory or executive function. Furthermore, other studies show that if you do both aerobic and resistance exercises, the improvement in executive function is more than each one on its own. A year-long trial of healthy older women, showed that lifting weights, even just once a week, resulted in significant improvements in tests of executive function. Especially relevant was that balancing and toning exercises did not. Seems like a combination of lifting weights and aerobic exercise might be particularly powerful. Especially relevant is that strength training triggers the release of a molecule called insulin-like growth factor-1 (IGF-1). IGF-1 is a growth hormone produced in the liver. Most noteworthy is that it is known to: affect communication between brain cells, promote the growth of neurons, promote the growth of blood vessels. On the other hand, aerobic exercise mainly boosts BDNF. In addition, strength training also decreases levels of homocysteine. Most noteworthy is that homocysteine is an inflammatory molecule that is increased in the brains of older adults with dementia. Therefore, by combining aerobic exercise with strength training, you get the most benefits. However, studies, so far, haven’t addressed how long the effects last. Furthermore, preliminary findings suggest adults will have to keep exercising to maintain the benefits. Most noteworthy, researchers in Australia found that increased muscle strength can lead to improved brain function in adults over 55 and with brain diseases such as Mild Cognitive Impairment (MCI). Furthermore, people with MCI have noticeably reduced cognitive abilities such as reduced memory, language, thinking and, judgement. Yet, people with MCI are still able to live independently. Most noteworthy, the team says the findings are important as people with MCI are at an increased risk of developing Alzheimer's disease and other forms of dementia. In conclusion, the more muscle strength people get, the greater the benefits for their brain. Yet, for maximum benefits to the brain, make sure you are exercising frequently, at least twice a week and, with high intensity. Most noteworthy, MRI scans showed an increase in size of specific areas of the brain. Furthermore, these brain changes were linked to the cognitive improvements after weight lifting. Latest study show that aerobic exercise also helps people with MCI. One of the characteristics of brain diseases such as Alzheimer’s Disease (AD) is accumulation of amyloid plaques between neurons in the brain’s white matter. 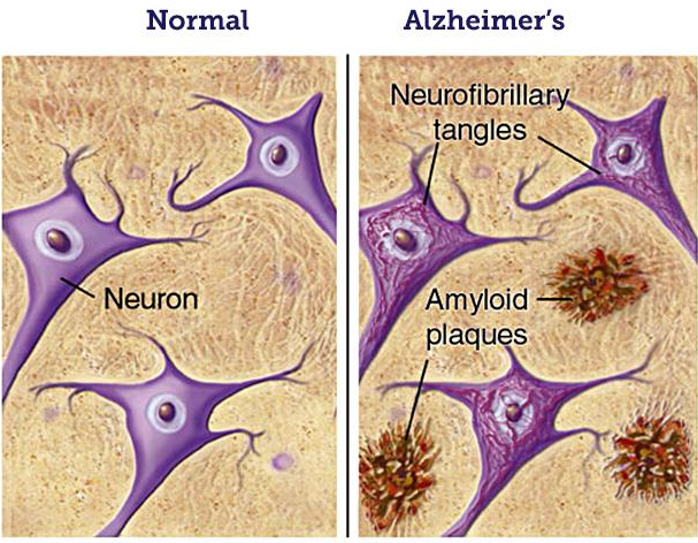 Also, amyloid is a general term for protein that the brain produces normally. Furthermore, Beta amyloid is a protein fragment snipped from an Amyloid Precursor Protein. Most noteworthy, in AD, the Beta amyloid protein fragments accumulate to form hard insoluble plaque and tau protein, which create neurofibrillary tangles. Most noteworthy, AD is characterized by an inexorable loss of neurons, particularly in the hippocampus and the cerebral cortex. Consequently resulting in cognitive dysfunction. Furthermore, evidence shows that physical activity has protective effects on cognitive function and memory in AD patients. In addition, evidence also strongly suggests that physical activity may attenuate cognitive impairment. In conclusion, exercise improves learning & memory; increases hippocampal cell growth, plasticity, volume and; decreases beta amyloids & fibrillary beta amyloids. Also, high intensity aerobic exercise by patients with brain diseases such as MCI, decreases concentrations of Beta Amyloid protein and Amyloid Precursor Protein metabolism. Furthermore, exercise is known to enhance hippocampus-associated memory and amygdala-associated neuronal function and serves as a means to delay onset of AD. Consequently, the most effective way to protect the brain and reduce risk of brain diseases such as AD, is prevention in the early stages. Therefore, aerobic exercises is one such factor. In addition, a recent meta-analysis confirmed that aerobic exercise can reverse cognitive decline typical of AD, at least in the short term. Also, people with or at risk of brain diseases such as AD, who did aerobic exercises, improved their cognitive performance. Furthermore, aerobic exercise had better outcomes than a combination of aerobic & resistance training. And those who attended a higher proportion of exercise sessions saw greater improvements in cognitive functions. Most noteworthy, one in 10 adults in the United States struggle with brain diseases such as depression. Furthermore, anti-depressant medications are a common way to treat this condition. Yet, exercise is another option. Especially relevant, research on depression, anxiety and exercise shows that the psychological and physical benefits of exercise can help improve mood and reduce anxiety. Also, exercise may help keep depression and anxiety from coming back once you are feeling better. In addition, neuroscientist have noticed that in people who are depressed, the hippocampus in the brain – the region that helps regulate mood – is smaller. First of all, aerobic exercise supports nerve cell growth in the hippocampus, improving nerve cell connections, which helps relieve depression. Also, low-intensity exercise sustained over time spurs the release of proteins called neurotrophic or growth factors, which cause nerve cells to grow and make new connections. As a result, the improvement in brain function makes you feel better. Seems like it’s not clear how long you need to exercise, or how intensely, before nerve cell improvement begins alleviating depression symptoms. Hence, you have to look at it as a long term treatment. In conclusion, it takes time to see the relief. Most noteworthy, brain diseases such as Parkinson’s disease is a neurodegenerative disorder that affects predominantly dopamine producing neurons in an area of the brain called substantia nigra. Furthermore, dopamine acts as a messenger between two brain areas – the substantia nigra and the corpus striatum – to produce smooth, controlled movements. First of all, most of the movement related symptoms of Parkinson's Disease are caused by lack of dopamine due to the loss of the dopamine-producing cells in the substantia nigra. Furthermore, when the amount of dopamine is too low, communication between the substantia nigra and corpus striatum becomes ineffective, and movement becomes impaired. Finally, the greater the loss of dopamine, the worse the movement-related symptoms. Most of all, it is not clear why the dopamine producing brain cells deteriorate. Furthermore, studies have shown that various dysfunctional cellular processes, inflammation, and stress can all contribute to cell damage. In addition, abnormal clumps called Lewy bodies, which contain the protein alpha-synuclein, are found in many brain cells of individuals with Parkinson's Disease. In conclusion, it is believed that dopamine loss is due to a combination of genetic and environmental factors. Symptoms develop slowly over the years. People with Parkinson's Disease may experience tremor, stiffness, slowness of movements, limb rigidity, gait and balance problems and, non-motor symptoms, such as: apathy, depression, constipation, sleep behavior disorders, loss of sense of smell, and cognitive impairment. Exercise can improve gait (with walking workouts), balance, tremor, flexibility, grip strength, motor coordination, depression, fatigue, fitness (with aerobic workouts), muscles (with resistance training), motor symptoms, balance and walking speed (with tango dancing). Increases beneficial glial-derived neurotrophic factor, which reduces vulnerability of dopamine neurons to damage. Dopamine travels across space between two adjacent brain cells called synapse. This process is called signaling and is essential for normal functioning. To end the signal, a protein complex called dopamine transporter normally retrieves dopamine from the synapse. Most noteworthy, exercise reduces dopamine transporter, causing the dopamine to stay in synapses longer and their dopamine signals last longer. Cells receiving dopamine signals have more places for the dopamine to bind and could receive a stronger signal. The binding site is the D2 receptor. Exercise increased expressions of D2 receptors. Vigorous exercise on treadmill has been shown to stop accumulation of neuronal protein alpha-synuclein in brain cells. Most noteworthy, clumps of alpha-synuclein are believed to play a central role in brain cell death associated with Parkinson's Disease. Vigorous exercise on treadmill has been shown to slow the progression of Parkinson's Disease. Running increases brain and muscle expression of a key protective gene called DJ-1. Most noteworthy, those rare humans born with a mutation in their DJ-1 gene are guaranteed to get severe Parkinson’s at a relatively young age. Furthermore, the DJ-1 protein is required for normal movement. Most of all, exercise may slow progression of Parkinson’s disease by turning on the protective gene DJ-1 and thereby preventing abnormal protein accumulation in the brain. In conclusion, people with Parkinson’s who exercise are likely able to keep their brain cells from dying. Most noteworthy, Vascular dementia is a form of dementia caused by an impaired supply of blood to the brain, such as caused by a series of small strokes. As a result, there is a decline in thinking skills. Especially relevant, MRI scans of people with brain diseases such as vascular dementia show presence of White matter hyperintensities. Seems like older people are prone to chronic ischaemia (inadequate flow of blood) that is associated with cerebral small vessel brain diseases. As a result, white matter hyperintensities shows up in their brain MRI scans. Also, white matter hyperintensities show up on MRI scans as areas of increased brightness. Especially relevant, they show tissue damage ranging from slight disentanglement of the matrix to varying degrees of myelin and axonal loss. Furthermore, white matter hyperintensities may result in brain diseases such as mild cognitive impairment, dementia, and possibly stroke. 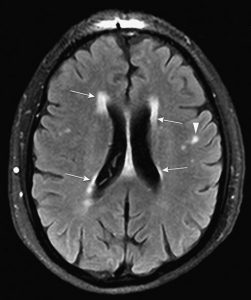 Most noteworthy, white matter hyperintensities may show up for any of the following reasons: Demyelination and axonal loss; reduced glial density and atrophy; cortical thinning and cerebral atrophy; Endothelial and immune activation; Ischaemic damage; Hypoxia and hypoperfusion. Furthermore, physical activity tended to limit progression of white matter hyperintensities. In addition, exercise decreases the presence of white matter hyperintensities in areas involved in motor control and coordination. In conclusion, older adults who engaged in life long aerobic exercise training had an 83% reduction in deep white matter hyperintensity volume when compared with their sedentary counterparts. First of all, brain diseases such as Bipolar disorder is a mental health condition that can cause low, depressive moods and high, manic moods. Therefore, medications and therapy are the primary treatments to manage the disorder. Seems like aerobic exercise can help some individuals, but not everyone. Therefore, always check with your doctor before trying out therapies. When you exercise the body releases endorphins which makes you feel good; Stress is reduced; Hypomanic symptoms, which are less severe than manic symptoms, are reduced; Better sleep occurs; Studies show that some people get a calming effect. Most noteworthy, this happens with walking, running, and swimming. Yet, studies also show that for some individuals, exercise could exacerbate manic symptoms. Furthermore, exercise could cause a worsening “spiraling” effect for both manic and hypomanic episodes. Especially relevant, recently, a published study reported that 12 weeks of aerobic exercise training significantly improved brain functioning of patients with brain diseases such as schizophrenia. Furthermore, in conjunction with medications, aerobic exercise augmented patients’ ability to cope with the long-term mental health symptoms of schizophrenia by improving their cognitive functions. Furthermore, acute phases of schizophrenia are associated with hallucinations and delusions. Consequently medications are used. Yet, many patients experience cognitive deficits such as slow information processing, loss of concentration and, poor memory. In conclusion, studies show that moderate to vigorous aerobic exercise help alleviate these cognitive effects. However, always discuss with your doctor before trying out new therapies. Increases white matter integrity. Consequently, the faster neural conduction between brain regions results in superior cognitive performance. Click here to see infographic on ways aerobic or cardio workouts help the brain. All four types of exercises (aerobic, resistance, flexibility and balance) help fight brain diseases. Furthermore, all of them result in physiological changes to the brain. Maybe, time constraint and/or individual preference causes you to focus on one type of exercise. Most noteworthy, use all four exercise types to get maximum benefits.